Justin Chapple may have trained at the French Culinary Institute, but he knows how people really cook at home. He grew up with a large family, first learning kitchen tricks from his grandmother who made do with whatever they had, and she made the food delicious. Now Justin is the host of Food & Wine's award-nominated Mad Genius Tips video cooking series, and appears regularly on TODAY and other television shows as their resident kitchen hack expert. In his job as the Culinary Director of the test kitchen, he's often asked to take recipes from superstar chefs (think David Chang and Thomas Keller) and simplify them for home cooks. 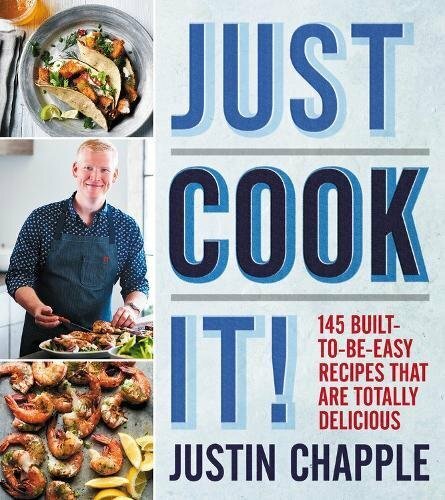 Now he is putting all of his expertise to good use in Just Cook It!, a collection of 125 mouthwatering recipes like Avocado Pizza with Dukka and Stovetop Mac-n-Cheese with Bacon Breadcrumbs, with Justin's signature time-saving tips and hacks throughout. There are things to love about this recipe—it is quick (maybe 8-10 minutes start to finish) and the potato flake coating is pretty genius (will def use that technique again). What fell a little flat for me was the choice of trout. The sweet, delicate flavor was lost here. When I make it again I'll choose a different fish, either a stronger flavored one (salmon?) or maybe a more neutral white fish like cod and really go for that "fish-and-chip" flavor that came through in this dish. Either way, it looks great, tastes good, and made for a quick weeknight meal. Here's another beautiful summer salad. The spiciness of the hot sauce was lost on me, I think it disappeared to let the other ingredients shine. I loved how the sweet and savory elements came together, the dressing an effective unifying element. The crunchy component of the the pita chips added a nice texture (mine were actually grilled naan cut it into triangles). In a pinch I think this would also be great without the melon as a bit of a deconstructed Caprese. It's not everyday you come across a recipe that includes imitation crab meat, but I totally agree with Justin Chapple, its both tasty and waaaayyy more affordable than the real stuff. This salad made for the perfect summer lunch—cool, refreshing, light, with just the right amount of each element. The grapefruit juice and olive oil dressing is just perfect with a few shakes of sea salt and a few cracks of black pepper. Recipe on oregonlive.com ↠ .